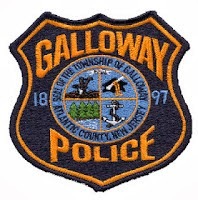 Galloway Township Police responded to 942 calls for service during August 24, 2014 through August 30, 2014. Additional statistics include: 7 Burglaries, 26 Motor Vehicle Accidents, 97 Tickets issued, 4 Driving While Intoxicated, 35 Arrests, 9 Domestic Violence, 19 Fire Calls, 101 EMS Calls and 0 Juvenile calls. Ahmad A. Little-Hannibal, 19, of Galloway was arrested by Ofc. Dominic Fabrizio for possession of less than 50 grams of marijuana on August 25. Sampson E. Jenkins, 20, of Galloway was arrested by Ofc. Dominic Fabrizo for burglary, theft, and receiving stolen property on August 25. Elmer J. Colindres-Cruz, 19, of Egg Harbor Twp. was arrested by Ofc. Scott Winneberger for DWI on August 25. James Lerario Jr., 19, of Galloway was arrested by Ofc. Jacqueline Crocker for manufacturing/distributing CDS, possession of CDS, and possession of less than 50 grams of marijuana on August 26. Jonathan S. Ferris, 38, of Galloway was arrested by Ofc. John Mooney for burglary and theft on August 26. Richard W. Souder III, 24, of Somers Point was arrested by Ofc. Vincent Ceci for hindering apprehension on August.26. Andre J. Legette, 30, of Pleasantville was arrested by Ofc. Dominic Fabrizo for possession of less than 50 grams of marijuana on August 27. Elijah Metts, 25, of Galloway was arrested by Det. Bryan Casey and Ofc. Scott Winneberger for possession of weapons, unlawful possession of weapons, aggravated assault, and possession of a weapon by certain persons not allowed have to have weapons on August 29. Sean P. Curry, 36, of Staten Island was arrested by Ofc. Scott Winneberger for DWI and refusal on August 29. Mahan Sadrgilani, 41, of Galloway was arrested by Ofc. Dominic Fabrizo for defiant trespassing on August 29. Fela I. Mandela, 49, of Ventnor and Tanisha N. Watkins, 24, of Galloway were arrested by Det. Bryan Casey for possession of CDS and possession of drug paraphernalia on August 29. Rodney Crosley, 43, of Galloway was arrested by Ofc. Scott Winneberger for DWI on August 30. Harold L. Rhinehart, 64, of Clementon was arrested by Sgt. Mark D’Esposito for DWI on August 30.